Parents have requested that we have date night again as our last one was a great success! We would like to begin this at our school either once a month or once every other month depending on the parents needs. Your feedback is necessary in order to proceed with making this happen as we want to hear what you think. 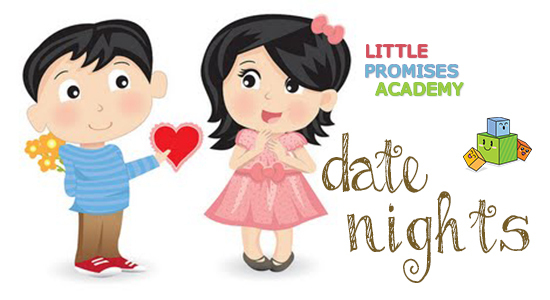 Date nights will be from 6:30 to 9:00 pm including crafts, snacks and a movie. Once the weather improves we will be doing organized games and activities outdoors. Kids will be decorating X shapes with tissue squares. 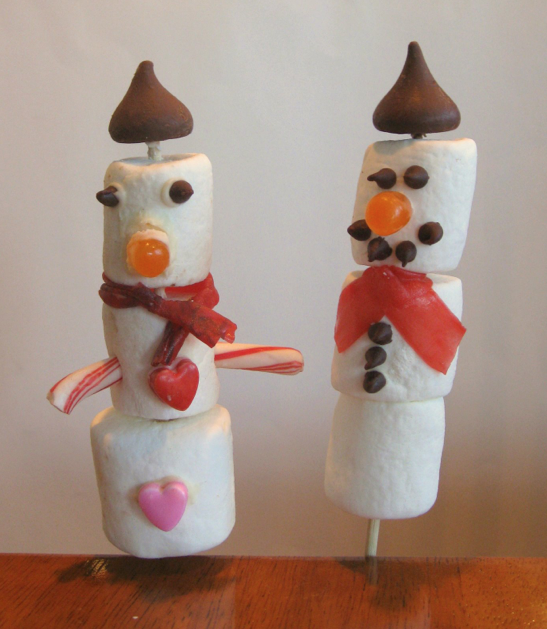 As a winter season discussion wrap-up, kids will be involved on creating our last winter projects that includes marshmallow snowman craft. They will be working with alphabet ice cubes that they will have to search for and identify. We are also going to wrap up the healthy habits and hearts discussions. X is this week’s letter. We’ll make colorful xylophones and X- rays of our hands! We’ll practice making Xs and 3s, 5s and 7s. To continue developing fine motor skills, we’ll practice cutting with paper plates, shapes and worksheets and use child safe tweezers(large,plastic and colorful) to pick up, sort and count a variety of small objects. Math activities will include making sets with small snacks and using clip on clothes pins for a number/shape game. We’ll make edible stegosaurs as part of our science lesson on dinosaurs. Reminder: The cookie fund raising money will be due in on Tuesday February 26th. Our letter of the week is W. This week we will be creating worms in dirt, whales in water and reviewing the overall monthly theme as we have missed class time due to the inclement weather. We will be also doing some additional valentine crafts for the kiddies who missed Valentine’s party last Friday. This week’s letter is W. We’ll make walruses, Ws with worms and oceans full of water, waves and whales! Science lessons will include discussions/ activities on weather and different climates and how they affect out food,clothing and activity choices. We’ll learn about the water cycle and make a poster together! In circle time, we’ll do sorting, counting and graphing with gummy worms. We’ll challenge ourselves with word searches(looking for color words and our names)! We want to thank all parents who have participated on providing their feedback to us. As we mentioned before, your opinion is very important to us in order to provide you a better service. For those parents who have not provided their feedback yet, please use the following link to submit the survey. The survey should only take about 5 minutes of your time and your answers will be completely anonymous. We will keep the survey form active for one more week to provide the opportunity to all parents to submit it! 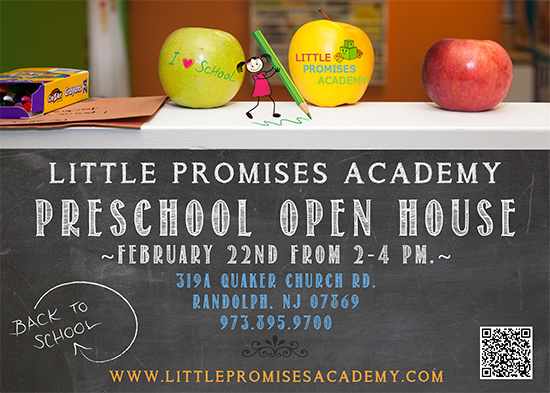 We have previously mentioned that the preschool will be hosting an open house on February 22nd 2014. We have added a friends-and-family referral program as part of the open house event for the preschool. The idea is that anyone who signs up during the next open house event on Feb 22nd as a result from a friend or family member referral will receive a one time $25.00 credit off their next month’s tuition payment. if you have two friends to sign up, the credit goes up to $50 dollars and so on. Bring your friends and family to the event who are interesting on join the school! Reminder: The school will be closed on Monday February 17th 2014 for President’s Day holiday. Next week’s letter is V and our weekly theme will be healthy hearts and teeth as we missed most of our lessons due to inclement weather. We will also touch on black history month. We have our in class trip Monday February 10th from 9:15 to 10:15 with Dr. Anthony Fusco. This trip is for all children who attend Little Promises on Monday and if you wish for your child to join you are required to call in advance. V is this week’s letter and we’ll use valentines and hearts for math and language activities. We’ll do sorting and graphing with heart-shaped marshmallows ! To celebrate President’s day we’ll learn about presidents Washington and Lincoln with stories and project/poems. For science we’ll make a “volcano” and watch it erupt!! We’ll make valentine cards and shape collages! Circle time activities will include a lesson on table manners(making a small booklet of reminder cards)!!! We’ll also review sharing: when it’s appropriate and when it ‘s not!!! Little Promises Academy is running a survey in order to understand how to better improve our service. Your feedback is very important to us. This survey should only take about 5 minutes of your time and your answers will be completely anonymous. 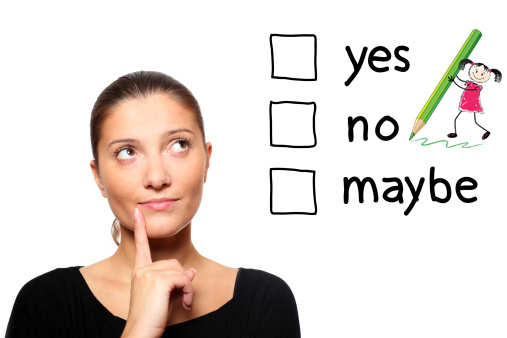 All survey results will be published in next month’s newsletter. 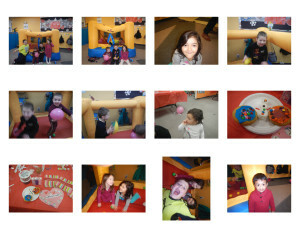 We are having a valentine party at our school on February 14th from 10:00 AM to 11:00 AM. All children are welcome but if your child does not attend in that day normally they need to call and sign up for that hour in advance. Monday Feb 10th 2014, we have an in class trip from 9:15 to 10:15 with Dr. Fusco at our school for ages 3 and up . Feb 14th we will be having a valentine party and letters will be sent home next week with items that are needed. 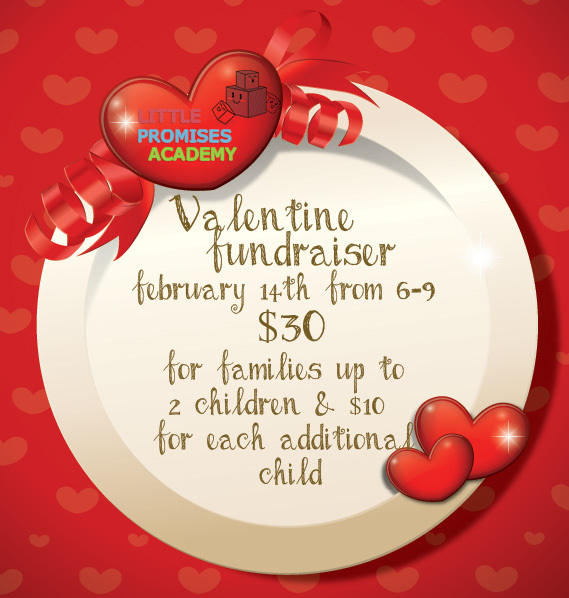 Preschool is hosting a Valentine Fundraiser event for our playground.It is parent night out event where you drop the kids off at 6:00 PM and pick them up at 9:00 PM. The cost will be $30 for families up to 2 children for ages 3 and up. $10 fee will be required for each additional child. We will have healthy snacks and drinks for all the kids as well as a cookie making station, and craft tables. Registration is required tomorrow by February 10th 2014. Toss out the junk food and start making snack time fun again! Check out these 20 kid-friendly ingredients that make great snacks, plus an easy recipe for each one. Healthy Hearts & U, the letter of the week. Next weeks theme is healthy hearts. We will be creating a healthy heart collage of good food that keep our hearts strong. Our letter of the week is U and we will be making our own umbrellas out of coffee filters and pipe cleaners. Another lesson we will be learning is how God created the universe and will be making a craft to accompany the lesson. In Circle Time, we’ll review, with math and language activities,numbers, shapes, letters and colors.we’ll practice uppercase/ lowercase letter matching and have a lesson on positional words. This week ‘s letter is U and we’ll make umbrellas and unicycles; both projects will challenge our math and organizational skills! We’ll have a Groundhog Day(1/2 between winter and spring!) story and science lesson and explore the science of shadows( indoors with flashlights)! At workbook time we’ll practice name writing and do simple graphing.